Discover a one-of-a-kind game-in-a-book-in-a-game -- the first kids book from Cranium! Forty rewritable pages packed with outrageously fun writing, drawing, guessing, and sculpting activities get kids celebrating all the ways they can shine. And the fun doesn't end with the activity pages. Kids can play the Mini Conga Guessing Game on a pull-out game board and record amazing facts about their family and friends in the Super Sign-In Book! Forty write-on and wipe-off activity pages, a pull-out game board, the Super Sign-In Book, Cranium Clay, 100 mini game cards, a game spinner, an erasable marker, a purple pencil, and 4 Cranium game pieces. 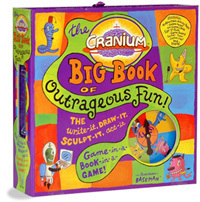 Cranium : Creative Cat Book of Outrageous Fun! Cranium : The Data Head Book of Outrageous Fun!